Christchur­ch, Rangiora, Kaiapoi, Rakaia, Ashburton, Amberley, Cheviot, Kaikoura, Timaru, Gearldine, Call us if your town is not listed. Our Service days and hours are Flexible just ask. Professional and quality service with out the price tag! 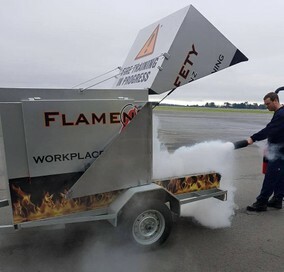 When it comes to portable hand operated fire fighting equipment you need the best in the field. That's why here at Flamen Safety we have mobile NZQA Qualified Technicians working with you to help meet your business needs. We endeavor to make fire fighting equipment AFFORDABLE! We are more than happy to supply a no obligation quote or if you would like free advice give our friendly technicians a call today.